You’re probably already fully aware that swimming is a great form of exercise. It blasts loads of calories without any harsh impact to your body. You can go at any pace, and between doing different strokes and drills, you can mix up your workouts in a jillion different ways. It’s kind of perfect—and even more so if you have access to a 25- or 50-yard pool! While all you really need is a suit and goggles (okay, and a cap if you’re like me and spend a good portion of your paycheck on maintaining your highlights, and maybe sunscreen and earplugs) in order to get a fantastic workout, there are lots of products on the market to help you enhance your swim. FINIS sent over three such products to play with while I was training for my tri—here’s my take. Now, I’m a watch, erm, watcher, I guess you would say—I track my laps and times religiously, but when I’m in the middle of a really tough set, my brain gets a little hinky and I can’t always remember my times. And, when I’m doing really long intervals, I’m terrible at keeping track of my distance, so I’m always doing an extra 50 (or doing 50 less than I’m supposed to). 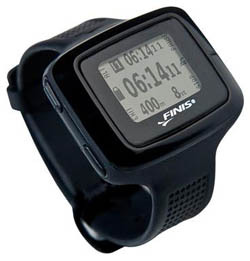 This fancy little Swimsense Performance Monitor watch is the perfect solution. It tracks your laps automatically—no buttons to push once you set it up and start swimming. It even adjusts to different strokes! After the workout, it’s easy for me to go through the data and retrieve my pace times and distance, and even more technical data like distance per stroke and calories burned. At $199.99, it’s not an inexpensive toy, but if you’re serious about swimming, it’s an incredibly helpful tool. 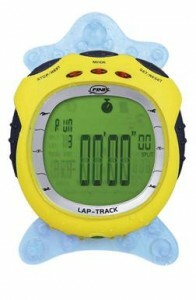 The Lap Track Swim Computer and Lap Counter is another handy piece of equipment to help you track your swim data. You simply set it up on the wall or ledge of your lane (it has a few set-up options, including suction cups and extenders to hang it), and you tap the front display to count your lap—it will track up to 50 laps, giving you time and distance, as well as calories burned. Now, I didn’t find myself using this counter quite as much as the Swimsense Performance Monitor even though it’s totally useful—I just got a bit spoiled by the automated nature of the Swimsense, I guess. But, considering this is less than half the cost, it’s definitely a nice option. On a slightly different note, I also tried out Zoomers, which look like fins but really are not the same thing, as I quickly learned. Zoomers are really a strengthening tool, promoting a short, fast kick that really works your legs. If you’re working on building leg strength and power behind your kick, these are awesome. Strength really isn’t a concern for me in the swim (and I know that sounds super cocky, but you guys know what I mean, right? 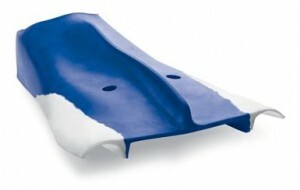 ), however, so I found myself opting for regular swim fins over the Zoomers, which run $31.99. I was just saying that I needed something like a lap tracker for swimming! Too bad it stops at just 50 laps. I frequently swim 60-70 laps and I’m working on increasing that. The Swimsense thing looks great, but I wish it had a heart rate monitor combined with it for that price. I’m currently signed up for a “Swim the English Channel” challenge at our fitness center. I’ve got June, July, & August to swim 680 laps, the 21 mile distance of the English Channel! Are y’all gonna do a Sunblock Review ? We were at the Water Park for 4 hours and re-applied, as required, but all 4 of use still got pretty bad sunburns. On a side note, I really hate that all sunblocks come in small containers, but you have to re-apply every 80 minutes; I end up using the entire can in 1 day ! Have you tried the PoolMate or Garmin Watches? I’ve used Poolmate for years, and I am thinking of upgrading. My PoolMate is several years old and keeps good count, but there are more advanced technologies available now. I use an iPod Shuffle with an H2Audio case. I have used it for years and like the sound quality, but I think the case is starting to leak. It had a one year warranty. I love having these devices to help with my workout, but it looks like I am going to need to upgrade before the open-water season starts!